Jason Halpin and Lukas Korver have been producing documentary film together since their graduation from Syracuse University’s Newhouse School of Communications in 2003. Their endeavors have taken them all over the United States as well as Europe, Australia, Africa, China, and the Middle East. 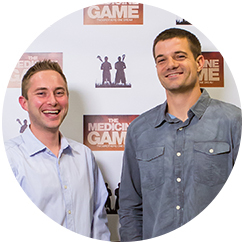 Their feature documentary debut began in 2006 with "The Medicine Game," a feature documentary that aired nationally on PBS in 2014, and toured the festival circuit that same year. Since then, they’ve teamed up to produce independent projects as well as branded content for Hitachi, Facebook, Vanity Fair, Rain Media, and many others. Lukas Korver and Jason Halpin capture tradition and determination in episode 2 of “The Medicine Game 2: Four Brothers, One Dream.” In this film, we follow young Miles Thompson on his journey as a lacrosse player as he walks us through his first professional game. With the support of both family and strangers alike, Miles’ story reveals not only his own strength but also the strong bonds and support of the Native communities. Though soft-spoken and always smiling, Miles aggressiveness on the field made him a champion of lacrosse and a force to be reckoned with. PBS: What was it that drew you to Miles’ story? LUKAS KORVER: I worked with Miles’ family before on a documentary, and after that documentary was completed I saw Miles and [his brother] Lyle enter the college lacrosse world, and it really kicked off from there. It developed a huge fan base, so I knew they already had a lot of built-in fans there. Then when you meet them they’re the most genuine, lovable kids, always laughing and smiling. They’re two really strong individuals. They saw their two older brothers struggle to make it into college, struggle with some misuse of drugs and alcohol. [Miles and Lyle] together got into school right away, which for that family was a huge moment. This was the first generation going to college. There were a lot of obstacles standing in their way, and Miles, he’s an older brother to Lyle, but Lyle acts more like a parent and keeps him more on track, keeps him focused. So Miles was just a perfect character to follow. PBS: During the film, Miles shares a really special moment when the surrounding Native communities meet him before his first professional lacrosse game to show their support. We get to see a glimpse of his reaction, but can you go into detail about what it was like for him to experience that love and support? LUKAS: I wish I was there for that. It ended up — the Georgia Swarm lacrosse team that he was playing for, they recorded the footage for me. But I have seen similar instances like that happen with Miles. It’s funny, he’s like an ambassador for Native American culture, but he’s also kind of a flag bearer for Native Americans. A lot of young kids look up to Miles and Lyle and see them at the forefront… they feel a lot of pride and encouragement from seeing how far Miles and Lyle have gone. There are a lot of role models out there but not in the public eye. But here are two guys who are in the mainstream public eye who are also great ambassadors, great role models, so I’m not surprised at all that 30-40 kids will wait a few hours in an airport to cheer this guy on because he means that much to so many people. PBS: So you mentioned that you were not there for that moment but looking back at the film, what was it like for you to see him surrounded by those fans and to see how far he had come in his career? LUKAS: It was amazing, because I met Miles when he was in 6th grade, a little pudgy kid, a very funny guy, but never did I think — I mean I didn’t grow up around lacrosse but I played sports my whole life. Here Miles didn’t have the flexibility, didn’t have the foot speed, he was slow — like this guy is not going to play Division 1. He’ll have a nice high school career, he’ll catch on to a nice Division 3 team, but to go on and break the all-time scoring record at the Division 1 level… he’s the face of lacrosse across the globe. It’s mind-boggling. I mean I’m surprised, but looking back I should’ve seen it, because this kid has that inner strength, he has that drive to push himself, push his body, push his mind as far as it will go. PBS: There are many themes within this film, from weight loss to the bonds and traditions within the Native American communities. For you, what is the main message that you want people to take away from Miles’ story? LUKAS: I should be more prepared for this answer, because one of the reasons I wanted to make this sequel is to get their message out. And I think the reason I’m having trouble finding what that message is, is because they have a lot of things that they stand for: culture, fitness, tradition, self-esteem, staying away from drugs and alcohol, living a healthy life, striving to have a healthy mind. I mean those are all things that are important, so I hope that — my goal is for people to be entertained by watching these guys, and through that, that they might possibly subconsciously absorb a couple messages or a couple things that younger kids can take home and kind of just be exposed to. I think that there are a lot of great athletic role models out there, but there are not so much today for Native Americans. There are just not a whole lot of athletes to look up to. There are certainly many that should be role models, but the limelight is only so big and these guys have found their way up to that level and they’re pulling more Native American athletes up with them. So maybe the third film will be a spin-off of people they’ve blazed the trail for. There are so many freshman and sophomore kids playing college lacrosse that have had just great role models, and it’s fun to know that these guys were part of the lacrosse revolution. Vision Maker Media shares Native stories with the world that represent the cultures, experiences, and values of American Indians and Alaska Natives. Founded in 1977, Vision Maker Media, a nonprofit 501(c)(3) which receives major funding from the Corporation for Public Broadcasting, nurtures creativity for development of new projects, partnerships, and funding. Vision Maker Media is the premier source for quality Native American and Pacific Islander educational and home videos. All aspects of our programs encourage the involvement of young people to learn more about careers in the media--to be the next generation of storytellers. Located at the University of Nebraska-Lincoln, we offer student employment and internships.